The big changes in the hospital landscape in Germany have many reasons. These include growing populations in urban areas as well as the increasing complexity of diseases, care, and treatment, driven by demographic change. Against this background, the cost of operators is increasing and the desire for cost-saving specialisation is growing. Clinic operators are responding to these requirements by addressing the area of conflict between quality and cost-effectiveness by processes of mergers and cooperation. They join together in regional associations to form hospital centres, quite often even to create large so-called “multi-suppliers”. Instead of further increased competition, they set a mark for more cooperation. In the Vehlener Feldmark, not far from the town of Obernkirchen in Lower Saxony, three formerly independent clinics merged to form the Agaplesion Ev. Klinikum Schaumburg. 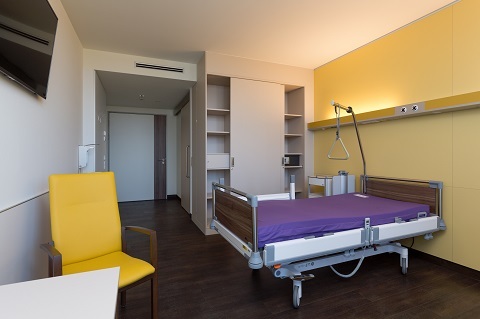 The operator and investor of the flagship project, which opened its doors in 2018, is the Agaplesion Group, Germany's largest non-profit corporation for hospitals and geriatric care facilities. 45,000 square meters of gross floorspace, including 24,000 square meters for medical and nursing areas, 14 integrated specialist departments, 9 operating theatres with hybrid operating room, 437 beds of different comfort levels, ... Figures such as these make it clear that architects and specialist engineers involved in the planning and realisation of major medical projects, such as the Agaplesion Ev. Klinikum Schaumburg, are faced with equally exciting and demanding challenges. Diverse outpatient and inpatient care units must be organised creatively, logistically and technically to form conclusive, economical architectural concepts. The cooperation with committed planning partners, who can contribute a lot to the success with experience and consulting competence in the health sector and not least with suitable products, is therefore essential: Häfele, a specialist in hardware fittings and electronic access control systems, based in Nagold, was able to win the Europe-wide tender for the new construction of the Agaplesion Ev. 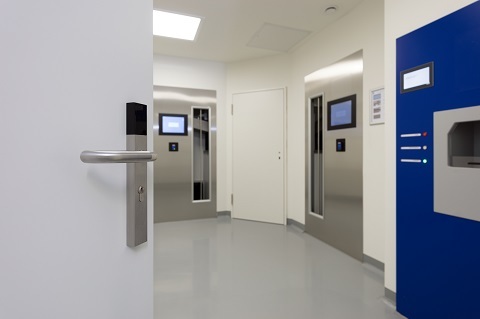 Klinikum Schaumburg and successfully contribute its 360° comprehensive project solutions in equipping the new construction with access control solutions, from the building envelope to the furniture. In regular weekly meetings with planners, specialist engineers, and the responsible builders' representatives, the globally operating company developed functional and appealing design solutions based on the wishes and specifications of the project managers in the area of access control and safety. 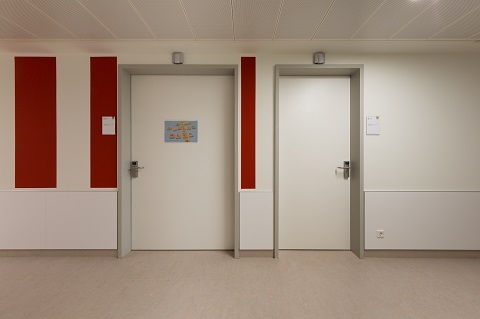 For example, Häfele integrated the Dialock identification system throughout the building complex: It controls parking barriers as well as elevators, covers a total of around 1,200 doors, and is found in built-in furniture, in the securing supply and medicine cabinets, as well as in employee lockers. 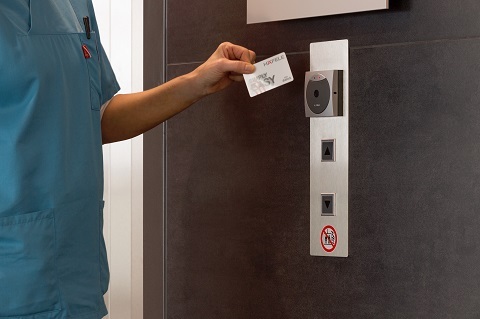 For the emergency opening of doors, on patient rooms and post boxes, on inspection hatches, and for locking already completed building areas on the construction site, Häfele supplemented the electronic access control system with mechanical locking elements. In the interior, numerous Häfele Symo furniture locks of various designs were used, as well as stainless steel fittings and furniture handles, building waste bins, and even the signage of the helipad is from the Häfele product range. 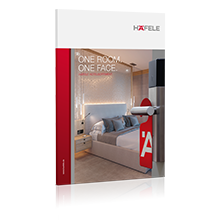 “With Dialock, Häfele offers contemporary, comprehensive access control technology. The clinic made a clear decision for safety, comfort, and high future viability”, confirms Patrick Hedwig of Sweco GmbH, who supervised the project as the responsible project manager together with his colleague Peter Schmiedgen. The hospital Rinteln, the Protestant hospital Bethel Bückeburg, and the district hospital Stadthagen were built in the years 1836, 1860, and 1933, respectively. In 2007, the idea of a central new hospital building was born, uniting the three facilities into a hospital centre in the Schaumburg Land. Since 2017, the vision has been reality. In 2013, the former Ludes Generalplaner GmbH (now Sweco GmbH), based in Berlin, developed the winning design by the Munich-based architects Schuster Pechtold Schmidt, to ready it for implementation. Ludes Generalplaner GmbH also took over the realisation on the former agricultural building plot. “Although the building did not have to be planned and realised in an urban context, it was nevertheless a great challenge to integrate the scale of this comprehensive, four-storey building complex into the landscape”, explains architect Patrick Hedwig. “By dividing the total area into three cubes of roughly equal size, centrally connected to each other via a covered glass entrance walkway and arranged in a valley, we loosened up the structural form of the hospital complex”, explains Hedwig. The architects took special care in the creation and design of the high-quality building envelope. It consists of ventilated façade elements that fit well into the landscape with their succession of window openings and fixed glass panels in different shades of green. The three cubes, slightly offset, cover the entrance area on three sides. 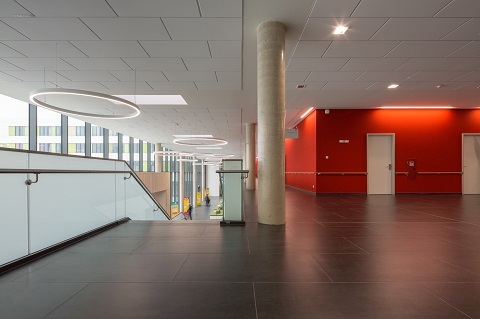 The large, light-filled foyer with reception and cafeteria is located in a fully glassed walkway. It unites the parts of the building and assumes a central distribution function in the sense of providing the shortest possible paths and optimised operating procedures. 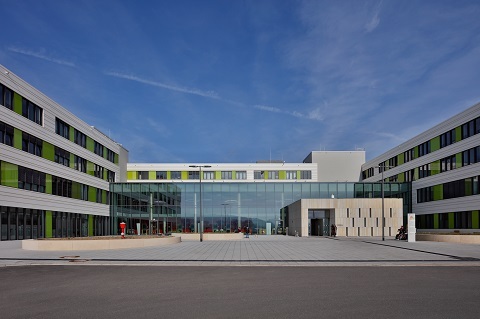 On the ground floor of the western cube, there are offices and administration as well as rooms for physiotherapy. The intensive care unit is located above it on the first floor. Beds and premium areas are located on the upper floors of the hospital. The northern Cube forms the technical centre of the clinic with its eight operating theatres and a state-of-the-art hybrid operating room. The sterile goods supply is located here as well. The central emergency room, radiology, and medical care centre can be reached quickly on the ground floor of the northern wing. 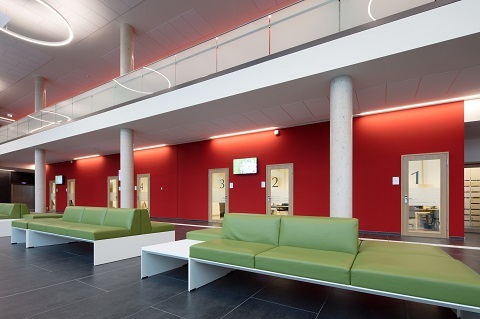 The outpatient centre and the chief medical offices are located on the ground floor of the eastern cube – supplemented by functional diagnostics and a number of treatment rooms on the first floor. All cubes have atria in their centre, ensuring that the rooms are equally well lit with daylight. While almost all patient rooms face the landscape, the staff rooms and treatment rooms face the courtyards. In addition to 14 specialist departments, the entire complex also includes the certified areas of the breast and endo-prosthetics centres, an ENT department, a pathology department, and an institute for laboratory medicine. In addition, several practices and clinical cooperation partners have their premises in the building. The basement of the sprawling building, which houses the complex hospital technology among other things, had to be designed as a watertight concrete basin to protect against the groundwater. To ensure a logistically smooth construction process, the Sweco architects planned the construction site according to the “windmill principle”: The western, northern, and eastern cubes were erected at different times as reinforced concrete buildings. At the same time, trades working in parallel accelerated the process: While the windows were mounted from the inside, it was possible to already install the façade cladding on the outside. This saved time and money. The planning of the building equipment – which included the access control system – required committed coordination: Therefore, the project advisers from Häfele were involved from the very beginning in order to be able to capture all areas to be integrated into the access control system as early as possible. It was necessary to assess each door individually with regard to its integration into the escape route plan and the fire protection concept as well as the resulting materials and equipment, and to determine the appropriate hardware. During the entire planning and construction period, deadlines were scheduled with up to ten different specialist planning offices and just as many external companies, and their trades and products needed to be coordinated with Häfele's plans. From the control of the parking barrier, the exterior entrances and elevator systems, the doors of the offices, the staff and supply rooms to the treatment rooms, practices, and operating theatres, and finally the medicine cabinets and changing room lockers for employees, the access and locking controls in the building all consist of elements of the Dialock electronic access control system. It is combined with mechanical locking elements from the product range of the international hardware specialist from the Black Forest. 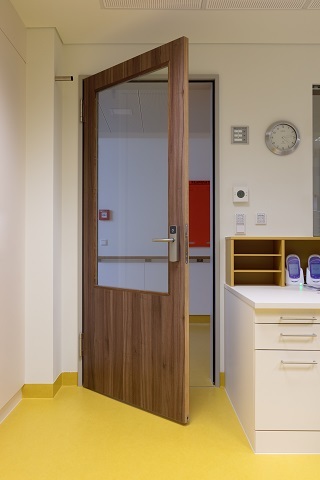 As per specifications, the patient doors are equipped without locks, only with hinged door cylinders. By contrast, all remaining doors are unlocked or locked by touchless Dialock door or wall terminals, using key tags and/or key cards and passive transponder technology, which staff carries, conveniently secured to their clothing. A transponder communicates with the Häfele terminals via RFID (wirelessly). It does not require its own power supply, but obtains its energy for communicating from the magnetic field of the terminals. The system is affordable and almost maintenance-free. The optional emergency opening uses mechanical keys. 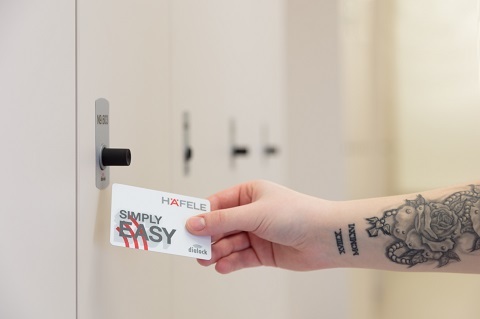 The total of 880 electronic furniture locks of the Häfele LockerLock system on the cabinets and fixtures integrated in the Dialock access control system can also be locked and secured with the Dialock key tag or key card. In the Vehlener Feldmark, not far from the town of Obernkirchen in Lower Saxony, three formerly independent clinics merged to form the Agaplesion Ev. Klinikum Schaumburg. The large, light-filled foyer with reception and cafeteria is located in a fully glassed walkway. It unites the parts of the building and assumes a central distribution function in the sense of providing the shortest possible paths and optimised operating procedures. The access and locking control in the building consists of elements of the Dialock electronic access control system by Häfele. On the interior doors, the DT 100 door terminals control the opening of the doors by means of transponder technology. 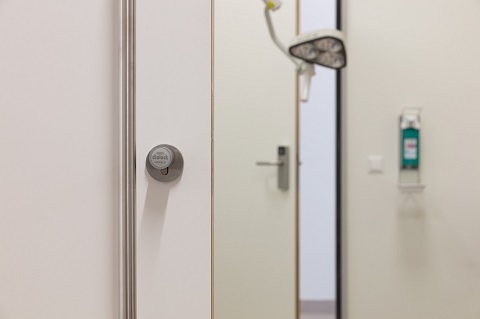 In the interior area (here a patient room), many Häfele products were used as well, such as Symo furniture locks in various designs, as well as stainless steel fittings and furniture handles and building waste bins. All automatic doors, including elevator navigation, are integrated into the Dialock access control system by Häfele. Here, the WT 100 wall terminals communicate with the key cards and key tags. The doors to the technical rooms are controlled via the Dialock DT600 door terminals. The DT 510 electronic profile cylinders by Häfele are installed on the sliding doors. The battery-operated “intelligent” thumbturn or double cylinder can be activated touchlessly with Dialock key cards and key tags. An illuminated ring indicates the occupancy status of the room. Even the lockers, which the staff uses for storage in the changing rooms, are locked and unlocked with Dialock. 880 LockerLock's by Häfele were installed throughout the building. 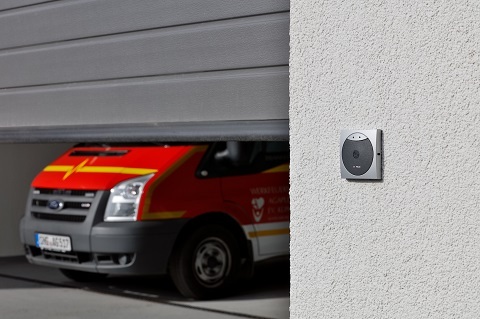 From the garage doors to the furniture lock: With Dialock Häfele offers Agaplesion Ev. Klinikum Schaumburg a contemporary, comprehensive access control system.